May 4th is dubbed Star Wars Day because, May the Force be with you, get it? This year, the week of May 4th brings us new movies from the likes of Dolph Lundgren, Jean-Claude Van Damme and Arnold Schwarzenegger! Yours truly is working with Magnolia Pictures and The Egyptian Theatre for the Los Angeles premiere of Skin Trade. Written, produced and starring Dolph Lundgren, Skin Trade takes real world topic human trafficking and turns it into a dramatic action movie. 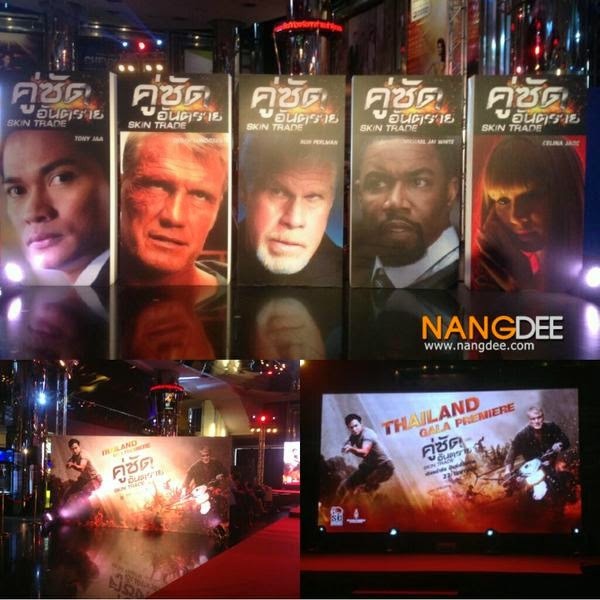 The supporting cast is immense with Tony Jaa, Michael Jai White, Peter Weller and Ron Perlman showing up as well. If you're paying attention, that's He-Man and The Punisher, Ong-Bak, Spawn and Black Dynamite, Buckaroo Banzai and Robocop and then Hellboy all in one 96 minute flick. Lundgren began working on the script for Skin Trade years ago after hearing a story about Mexican immigrants who died after being left in a van somewhere along the border. The flick is now the story of a NYC cop who hunts a vicious gangster to Thailand and teams up with a local detective to destroy human trafficking syndicates. Tony Jaa plays the Thai detective while Jai White shows up as a mysterious suit clad type who can fight, Weller as some kind of federal agent boss and Perlman as the gangster. Shooting in Thailand last year under director Ekachai Uekrongtham, the action flick boasts explosions, helicopters, martial arts and car chase mayhem galore. Skin Trade hit The American Film Market and it was quickly announced that Magnolia had purchased North American rights. The film received an extravagant release in Jaa's native Thailand and Dolph just showed the movie in Australia while there for repertory screenings of Universal Soldier and Rocky IV along with appearing at a couple of conventions. Magnolia is running the show on this one with a media day in Beverly Hills on Tuesday, 5.5 before the premiere on Wednesday where more media and the red carpet await. Reviews have been positive thus far with the simple yet engaging story backed by some big action pieces and fights. Like many of Magnolia's acquisitions, Skin Trade became available on VOD and iTunes preceding a small theatrical release. After it's Hollywood premiere, Skin Trade will play at the Sundance Cinemas on Sunset the same weekend as Arnold's limited release zombie drama, Maggie. A small number of general admission seats are available for the Skin Trade premiere so head over to Fandango to pick them up and see it on the big screen the way it was meant to be experienced. Dolph and Tony are expected to attend, hopefully with co-stars Peter Weller and Michael Jai White stopping by if they're in town. See you there!